I figure a lot if not all twins, (and triplets, quads, quints, and sexts) have relationships similar to my boys'; there is love, and there is hate. When you start life out together in the womb, you have more practice and experience fighting and jostling to get the best for yourself than other siblings have. On the one hand they want to be together always; on the other, they want clear definition between what is "mine" and what they reluctantly admit is "his." When the boys were newborns, they slept together in the basinette. I wish I had thought to take a picture of them, swaddled up tight and laying side by side in that little basinette, like two little sausage links. But we blinked, and suddenly they were too big for the basinette. Then they slept in the same crib for a short while. Soon though, they were rolling around and waking each other up, and we had to separate them into separate cribs. They still work each other up, so we ended up putting Zack to bed in the portable crib in our guest room. More and more often. They weren't loving each other, during sleep time. They were making each other more tired and cranky. Eventually we just gave in and moved his crib in there. 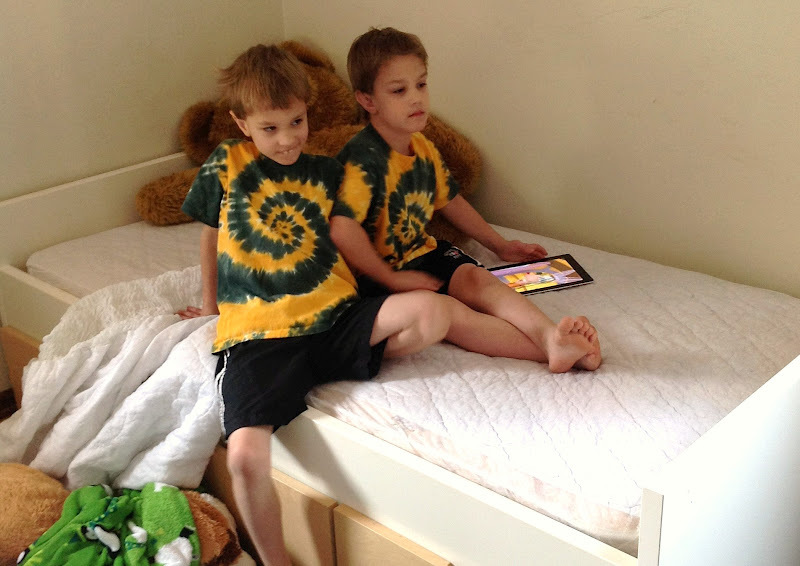 They've been in separate bedrooms since they were two. And I never really stopped treating Zack's room like the guest room. I didn't decorate it for him. I still used it as the room to stow stuff I didn't know where else to put. But it didn't have a regular bed in it anymore, so if anyone stayed overnight, we had to put them up on our couch. Zack didn't seem to mind. He didn't do anything but sleep in there, anyway. Neither of them seemed to mind. But it's not what I had envisioned, having twin boys. 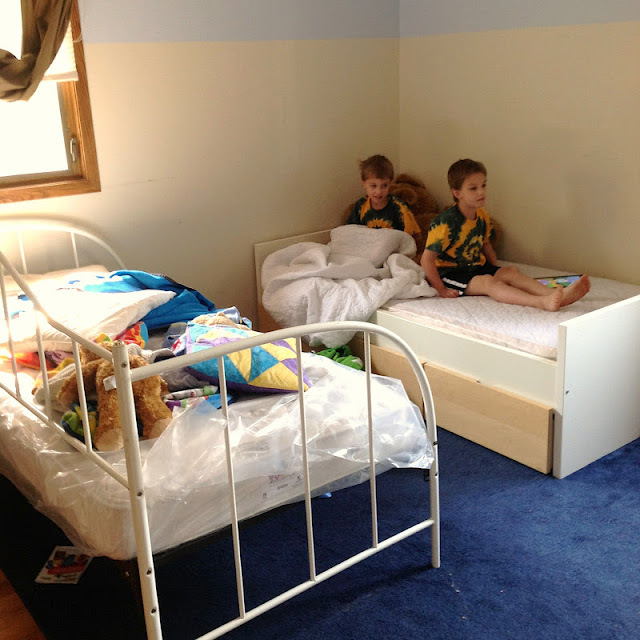 I had decorated the bigger bedroom, planning for both boys to sleep in there together. This summer I started thinking about moving them both back into AJ's room. There was room for two beds as long as they weren't queen sized beds. They were sleeping much better than they were 5 years ago. 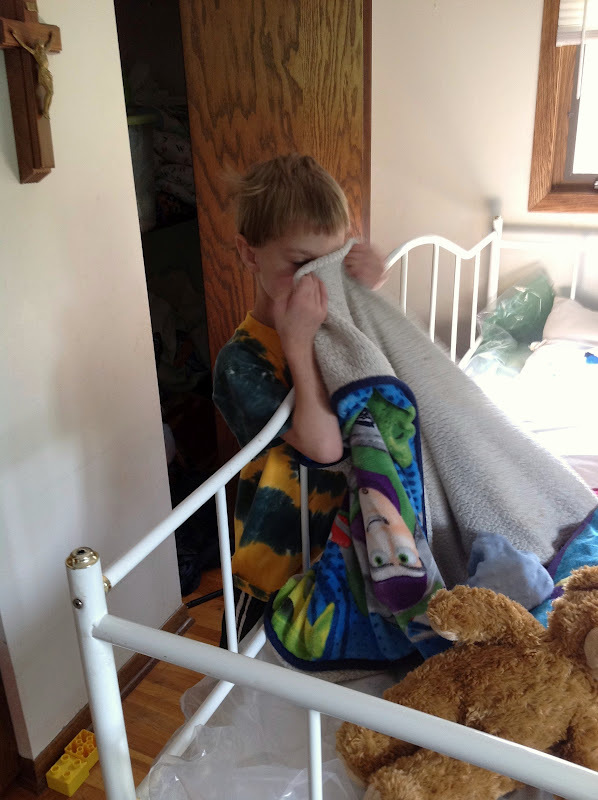 They usually wake each other up anyway - as soon as one wakes up, he goes into his brother's room. And, if we put them together in one room, I'd get my guest room back! So this week we did it. They have been doing great, being back together in the same room. It took Zack a few days to get used to going to the big room at the end of the hall instead of turning into the spare room, but he's totally on board with the new arrangement. Sometimes they go up there together just to hang out. It's closer to what I imagined having twins would be like. It's so nice to see them be able to be together. So far, the cat is the only one who has slept in the guest room, but she says it's quite cozy.